Anyone who knows Commercial Drive knows Joe’s Cafe on the corner of William Street. I can only surmise that, even in the hyper-ballooning real estate market of 1910-1912, he couldn’t raise the $10,000 and had to settle for a less ostentatious addition to Commercial Drive. While researching the previous post, I came across this image of the Methodist Church at Venables and Victoria. 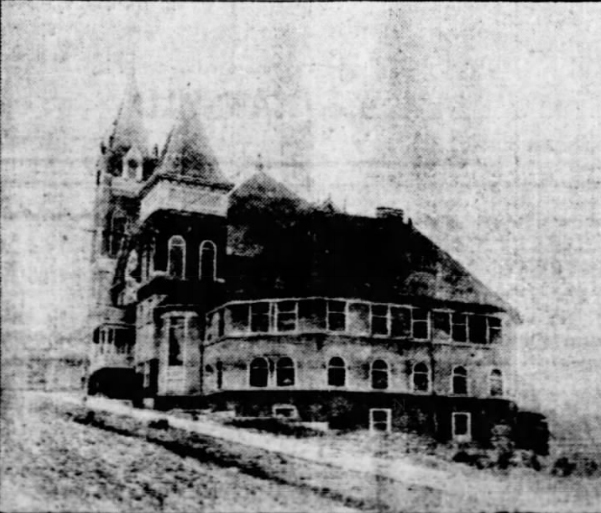 The quality of the image is not great (old newspaper + microfilm + online) but I am sure this is the earliest image of the church as it was taken before the dedication ceremony in March 1909, and was published in Vancouver World 1909 Mar 6, p.13. This is, of course, now the Vancouver East Cultural Centre. The following is what is almost certainly a previously unknown photograph of the clearing of Victoria Park in 1909. The image was taken by Edward Faraday Odlum and is shown here courtesy of Ms. Ruth Raymond, a descendant. This is a view of the as-yet-uncleared Park looking north from the south-east corner of Grant Street & Victoria Drive. The houses are on what was then Bismark Street (now Kitchener). The old Fire Hall and the Queen Anne-style Jeff’s House at Charles & Salsbury can be seen in the background. This is a marvelous addition to our knowledge of the Park and we thank Ms. Raymond most sincerely for sharing this treasure with us, and to James Evans for forwarding it..
On Thursday evening last, Fr. Eugenio, pastor of the St. Francis of Assisi parish in Grandview, very kindly invited a group of GHG members and friends to the Church on Napier Street where he took us on a tour of both the church and the rectory where he lives. In the early 1920s, Franciscan monks took over the mansion called Wilga on the corner of Napier and Semlin that William Miller had had built for himself in 1909. It became a monastery and at one point, there were sixteen friars living in the house. In 1939, the Catholic diocese decided to move the parish church from it’s original location at Broadway and Victoria and they built the church that now stands next to the monastery. The monks left the house in 1990 and it became the rectory for the parish priest of St. Francis. The church is a modest Romanesque building that fits rather well into the streetscape. Being of a comparatively young age, there is little of historic value to the building itself but it has an inestimable value as the community centre for Catholic and especially Italian life in the neighbourhood. The stained glass windows were installed in the 1990s as were the new pews. It has to be noted that the pews are Gothic (rather than Romanesque) and their light coloured wood jars somewhat with the rest of the interior. That being said, the “feel” of the church is neighbourly and warm. It is no surprise to learn that the parish is seeing a revival of young families. One piece of church furniture that has an historical connection is the baptismal font which began life as a flowerpot owned by the Tsar of Russia. Fr. Eugenio noted that when he took over three years ago, the fabric of the church was in sorry disrepair and he had spent much of his time simply fixing what needed to be be repaired. He has done a marvelous job. The exterior of the building is still of classic proportions and the gardens that take up the balance of the lots between Napier and Parker give it a scale and grandeur that is missing from most of our local mansions. The interior is still full of original woodwork and fascinating touches, though the upstairs has been remodeled over the years — primarily to create bedrooms for the 16 monks, I would think. The building is set at almost the peak of Grandview Hill and from the bedroom on the third floor and the sitting room on the second, there is still a magnificent and unobstructed view across the Inlet to North Vancouver and Grouse Mountain. I suspect that originally, before the development of the neighbourhood, William Miller would have had an equally fine view of the city from the front porch. These old mansions are a precious part of our neighbourhood and it is a joy to see the interiors. This is Fr. Eugenio’s home, of course, and he was most gracious in allowing us to amble over the whole place. We also want to thank several ladies of the parish who prepared a groaning table of seasonal goodies for us. We are grateful indeed. In an earlier post, I had discussed James Guinet who began work in our neighbourhood by building himself a family home at 1556 Grant Street. Now, through the generosity of James Guinet’s grand-daughter, we have a photograph of that house taken just after it was built in 1909. I would be fascinated to learn when and why the street was so significantly regraded. Between 1908 and 1912, during the boom that essentially created Grandview, James Guinet was responsible for building at least 45 houses in the community, and probably more. But only the barest of facts are known about him. These are notes for a biography of what might be one of the most important figures of Grandview’s early history. Family history has it that the Guinets were house builders in Muskoka but sometime in the 1890s the family moved to British Columbia, settling in New Westminster where, by 1901, all the males were working in the building trades. The father, Mitchell, and James were carpenters, while Victor, Michael and John were employed as labourers. In the twelve months prior to the census that year, James had worked every month and earned $650. His brothers were making $480-$500 each. By 1904, the youngest brother, John Davis Guinet, had moved to Vancouver, finding lodging at 242 Barnard (later Adanac) Street. In the following year he had been joined by James and Michael and they all took rooms together at 1155 Denman before moving again to 911 Drake Street. In 1906, James, then 33, married the 22 year old Margaret McInnes. The couple stayed on in Drake Street, while the brothers took a place at 1503 Venables Street where they were joined by their father and mother. There is a “dark ages” of Vancouver development between 1905 and 1908 during which period the building permits have disappeared. James Edward Guinet took out a building permit for a house on Seymour Street valued at $1,000 in December 1904, the first known in his name, and he re-appears, as we shall see, as a busy builder in 1909. However, we are left simply assuming that he was developing houses during this dark period, perhaps in Grandview. He certainly listed himself as a contractor in the Directories for those years, and by early 1909 he and his wife had moved into the neighbourhood, to a house at 1556 Grant which he may well have built himself, though the permit is missing. January 1909 saw Guinet receive a building permit for four “cottages” at 1128-48 Odlum Drive. These still stand. In March he was working on two more houses at 1133 and 1143 McLean Drive. These first six houses for which we have records were each valued at $1,000. His next set, four houses comprising 1704, 1710, 1716 and 1722 Cotton Drive, for which he received permits in April, each cost $1,500. This run of buildings is also still in place today. By June 1909 he was building a $1,500 house at 2156 Napier Street, and another set of four houses in the 900 block McLean Drive. These last were valued at $1,800 each and survived until the Britannia expansion in 1970. August and September brought forth 1141, 1143, 1145 and 1149 McLean, along with another row of four houses along the 1700-block of Cotton Drive. He closed out the year by building four more houses across the street from his own home on Grant Street. All 13 of these houses survive to this day. By 1910, several of Guinet’s new houses were being valued at $2,000 a piece. In January he recieved permits for 1316 and 1322 Cotton Drive and 1216 and 1222 Woodland Drive. In February he built a smaller house at 1953 Bismark. April saw new permits for 1423 Woodland Drive, and a series of three houses along the south side of the 1400-block Parker Street. In May he retuened to McLean Drive, building four more houses along the west side of the 1000-block. He closed out the year, in October, with a permit to build 1737 Charles for $2,600. The only permit available for James Guinet in 1911 is for the four houses that make up the double corner at Victoria Drive and Graveley Street. However, these were the most expensive series of houses in his resume to date at a cost of $2,500 each. The four houses — 1521-1541 Victoria and 1885 Graveley — are still a part of the neighbourhood. More importantly for James Guinet was the purchase that year of a 1905 house at 2575 Cornwall Avenue where he moved his wife and young son, Allan. Perhaps he needed more space for his family or, perhaps, the view over English Bay seemed better than that at Grant Street. He built himself a garage and settled in. In 1912 he built the lovely Belmont Building at 1435 Commercial Drive, and four houses on Keith Drive in Cedar Cottage. These are the last of the permits we find in his name although he continued to be called a contractor in the 1913 Directory. By the middle of 1914 he was working for Waghorn, Gwynn & Company as a real estate valuer. It seems likely that he was the victim of the global economic crisis that struck in the lead up to World War One and which effectively put a stop to speculative building in Grandview and most places in Vancouver. However, he must still have had some capital as in 1915 he purchased the John Denholm Farm on Fairfield Island in Chilliwack, moving there with his wife and son and taking up farming. Although the rest of the family remained at 1503 Venables for several years, James’ brother John Davis also moved to Chilliwack, and it was from there that the two brothers enlisted in the Canadian Army in 1916. They both survived the experience, James Edward Guinet not dying until 17 February 1958. His son, Allan Guinet, became a lawyer and magistrate in Chilliwack, co-founder and benefactor of the Chilliwack Historical Society which holds his papers. This is probably the longest post on this website but it still seems like so little information about a man who contributed upwards of 50 buildings to the Grandview community. We need to know more about James Guinet and pioneers like him. What inspired him to choose Grandview? How did he develop his first capital? Why did he build the styles of houses that he did? What really caused him to stop building in 1912 or 1913? He and his kind are far too important to be forgotten.